There are at least 7 references to earthquakes in the book of Revelation alone. The beast of all historical earthquakes is to take place in Revelation 16:18 And there were flashes of lightning and sounds and peals of thunder; and there was a great earthquake, such as there had not been since man came to be upon the earth, so great an earthquake was it, and so mighty. The end result of this earthquake is Revelation 16:20 And every island fled away, and the mountains were not found. These passages are suggestive of significant, changed geography of planet Earth. No more islands, no more mountains! What we are seeing now (July 2014) is a starter kit. 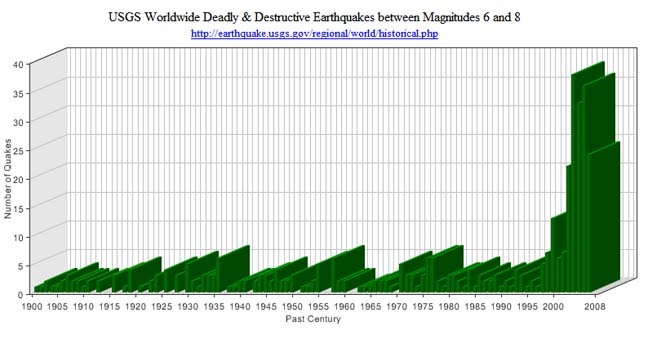 Are there actually more earthquakes taking place as time goes by? Or does it just seem like it? 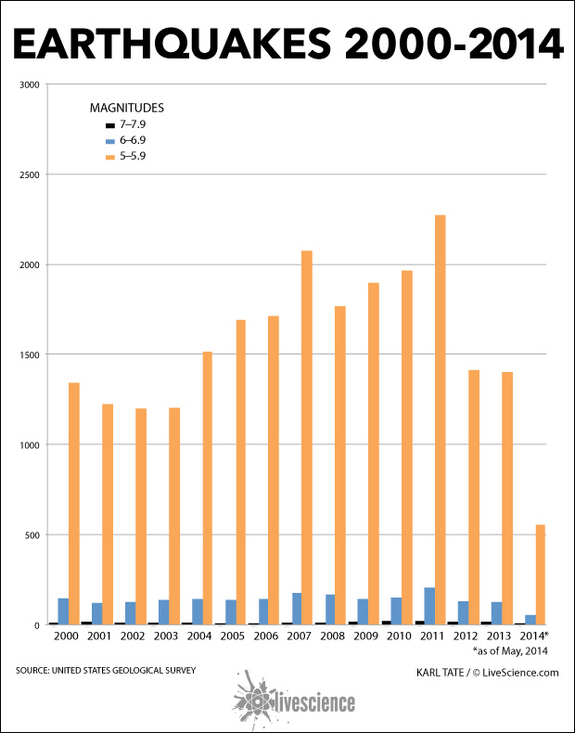 It seems like earthquakes 5.0 or greater on the Richter Scale are becoming common place. At times, they seem like white noise. What do the numbers indicate? Here are two graphs noted below. The source for the information is the United States Geological Survey (USGS). This entry was posted on July 9, 2014 at 8:53 PM and is filed under Earthquakes/Volcanoes, Prophecy with tags earthquakes, Jesus Christ, Luke 21, Mark 13, Matthew 24, Olivet Discourse, Revelation 16, Richter Scale, United States Geological Survey (USGS). You can follow any responses to this entry through the RSS 2.0 feed. You can leave a response, or trackback from your own site.